I live in Miami and sometimes you want to escape Paradise and go to... the Bahamas! 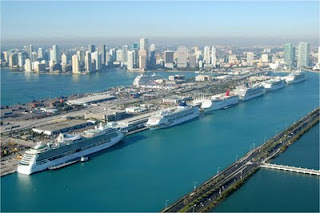 During my morning commute to the gym I drive by the port of Miami. If you do that every day, you get familiarized with the ships and as a cruise lover, I enjoy seeing them coming and going everyday. If you are coming to Miami and don't want to spend a whole week on a cruise ship, all cruise lines offer weekend cruises: 3 nights - Friday afternoon through Monday morning - visiting Nassau and a private island. The downside is that the oldest and outdated ships are used for these cruises. 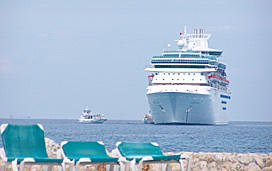 Royal Caribbean uses Majesty of the Seas for this route. A ten year old ship very worn out and at the end of its run. I did it once and that was enough. Carnival uses Carnival Imagination. Well, let me just say that after more than 25 cruises, Carnival is not my favorite cruise line and I would never cruise on Carnival again. There is a specific target for their product and I'm not included... thank God! And then NCL uses Norwegian Sky, the nicest ship for a weekend getaway from Miami. It's a small but decent ship with everything you need for three nights. Great restaurants - two included, three for a fee (so worth it), comfortable staterooms... I didn't go on a cruise to mingle. The crowd is not high class, but you can enjoy yourself with friends, or have a romantic getaway with a loved one. In any case, I've been there and I have done all of them sol if you have to choose one cruise for a weekend, go with Norwegian Sky... you won't regret it!